If a tooth is weak or broken, then it is important to repair the tooth as quickly as possible. Sometimes the damage is beyond the point where a basic tooth filling will help, which is why you might consider the benefits of dental crowns. Here at Simply Teeth, we are dedicated to providing you with the highest quality dental treatments that are available. Dr. Dhaval Patel offers crowns for teeth to improve your smile. 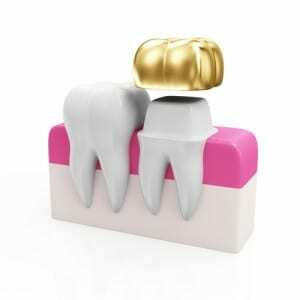 Do You Need A Dental Crown For Your Tooth? When you are at a dental appointment, there are several reasons why dental crowns might be suggested for your teeth. It is always a good idea to discuss your individual dental health with your dentist, in order to determine the right treatment that will help with your smile. Tooth crowns might not be right for every situation, but there are many circumstances where this dental treatment can be very beneficial. The procedure is very safe and effective, giving you the peace of mind to know that you are protecting your dental health. The appearance of your smile matters, especially because it has a direct impact on your confidence levels and overall satisfaction with your appearance. Do you find that you hide your smile because you are embarrassed about missing teeth or other dental problems? Instead of hiding your smile in embarrassment, it is better to use dental restorations to create the smile that you have always dreamed about. Tooth crowns are a fast and effective way to transform your smile, and this treatment is a long-term solution to help with your dental health. Many people find that they are more confident about their appearance after their smile has been improved, and the dental crowns procedure might be the right solution that you are searching for. To learn more about the benefits of dental crowns, contact us at Simply Teeth to schedule a consultation.